With Twilight being as popular as it is there has been an incredible amount of interest in everything Native American and wolf related. The thing is, Stephenie Meyer barely grazed Native American history, and her supposed facts aren’t exactly accurate. So here’s a small look into the expansive world of Native American wolf gods and spirits. But first, please keep in mind that every tribe shares their own legends, that not all Native Americans have the same beliefs. Chibiabos: This being is Lord of the sky and wolves, as well as Lord of the Spirit Realm. His brother is Manabozho, the trickster rabbit god. Malsumis: In Abenaki his name means “wolf.” It is said by some that Malsumis is Glooskap’s evil twin, that he was responsible for putting thorns on plants and giving the insects their sting. But many tribe elders disagree, it is likely that the legend was twisted by Anglo corruption. 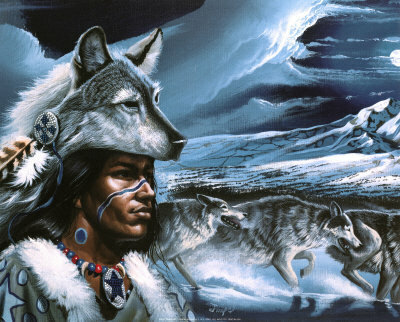 Afterall, there is also the Algonquian hero, Nanabozho, who does have a twin brother that is a wolf, though that being is Nanabozho’s closest friend, not an evil creature. Rhpisunt: A woman that married a bear and gave birth to human-headed bear cubs. This obviously has nothing to do with wolves, yet she is the protector of the Haida Wolf Clan. Coyote: This god is (you guessed it) a coyote, yet through my research I came across countless sites that labeled him as a wolf god. Now, after reading about him I can’t see why they would do so, but I’ll write about him either way and maybe you guys can discover what makes him wolf-like. There are countless stories about this trickster god. It is believed that he is not only the creator of the Milky Way, but he is also responsible for the diversity of mankind. One of my favorite Coyote stories is the one about how he was made the replacement moon. At first everyone felt that he made a fantastic moon, but from his elevated position he could see everything, and being bored in the sky he couldn’t help but watch people and tell on them when they were doing something wrong – this got him kicked out of the sky. Unfortunately, they couldn’t stop him for long, because one day while he was juggling his eyeballs, he threw one so high it got stuck in the sky and became the star Arcturus. Which means that even now he’s keeping an eye on everyone.